When Abigail Mackenzie left the police force to become a farmer and beekeeper in beautiful Las Flores, California, she thought her days of criminal investigation were behind her . . . Her present life is mostly filled with hard work and happy occasions, including the upcoming event with her friend Paola, a truffle maker, who’s renewing her vows with her husband Jake, owner of the Country Schoolhouse Winery. Abby is delighted to provide her trademark lavender honey for the occasion. But after the ceremony, the guests of honor are nowhere to be found. When Abby goes looking for them, she hears a gunshot and discovers Jake dead in his car and Paola injured beside him. Who was the intended target? Jake had a reputation as a busy bee with the ladies. Is it possible that one of his flings, stung by rejection, took revenge? Or could it be sour grapes with one of his colleagues at the winery? If Paola was meant to be the victim, Abby needs to protect her as she searches for the shooter. When a second murder occurs, it’s up to Abby to crush the clues—before the killer gets her over a barrel . . .
Includes farming tips and delicious recipes! I am all abuzz about this series. Former police officer Abigail Mackenzie just keeps finding dead bodies. This time she finds her friend Paola’s husband, Jake dead and Paola has been wounded too, right outside the party celebrating their marriage renewal. Jake was not her favorite person but she would never wish him dead. Was he the real target or was Paola? Was it business or personal? Abigail is having a honey of a time trying to figure everything out. When another person is killed she bee-lieves she is close to solving the case. She just needs to keep herself safe while she gathers enough evidence for her friends at the PD. The story is well paced with real life and murder investigations in a nice balance. The suspense really builds as Abigail becomes more of a target and everything and everyone she loves falls into the killer’s sights. There are some nice twists and some really scary moments to keep readers on this toes. Again, the descriptions gave me more of watching a movie feel. The author makes visualizing everything so easy. Ms. Lester has really taken us on a journey with Abigail over the course of the first three books in this series. We know she is a top notch investigator but she has some serious issues she is dealing with. She has been through so much and is fighting PTSD. The author handles this so well in a very true, real, and believable way. Abby still drops herself right into the middle of an investigation, because that is just who she is, but friends on the force are getting pretty used to that by now. The good thing is she reports what she finds to them and even shares her theories no matter how far-fetched. Her personal life is blooming just a bit too. I have really become invested in this character and am excited to see what happens next in her life. The farms tips were very interesting and the recipes sound delicious. This is a great addition to the Henny Penny Farmette Mystery series. I recommend all three books! I can’t wait to return to Las Flores, California to visit Abby and her friends! Find out about Meera Lester and her books on her webpage here. 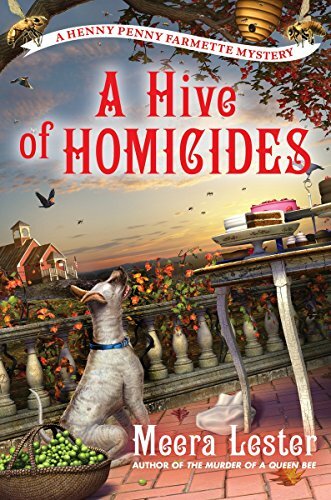 A Hive of Homicides sounds like a honey of a book that I’d love to read! The cover is so entertaining and I am looking forward to putting it on my to be read list. Oh how I wish I could sit and read all day long! I know you’re not supposed to judge a book by its cover but this series, oh my! They all pull me in! This book sounds great. I will have to start the series. This sounds like a great series . Will put on TBR. The cover is really eye-catching & the excerpt is super enticing! Great review!